The Skanner News - New Greenway in NE – But Where? New Greenway in NE – But Where? You’ve heard that Northeast 7th Avenue might get shut down but where do you air your opinion about it? The Portland Bureau of Transportation is extending public comment on its Lloyd to Woodlawn Neighborhood Greenway project through the end of this month. The bureau has a detailed slideshow presentation online for viewing at your convenience, with a chance to leave feedback. Find that slideshow here. Those without computer or smartphone access can call PBOT directly and share your views of the greenway plan at (503) 823-5185. Many are concerned that the proposed greenway would clog the streets around Albina Head Start at Northeast Fremont and 7th. It’s a major intersection with the organization’s main office and a large childcare facility. So far several observers around the city are publicly suggesting that the 7th Avenue route is most popular, but it’s still not too late to weigh in on the decision by filling out a comment form online or calling PBOT directly. The work is scheduled for completion over the next few years. 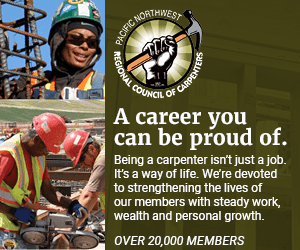 “Our online open house will be available on the project web site through Aug. 31 and we plan to have more meetings and other opportunities for people to engage,” PBOT spokesman Dylan Rivera told The Skanner. The Greenway Project would take one street that connects the Woodlawn neighborhood to the Lloyd District -- whether that’s Northeast 7th or Northeast 9th or some combination of the two has not yet been officially decided -- and create a slower transportation corridor for pedestrians and bikes by adding traffic features including crosswalks, a few “green boxes” painted on the street for cyclists at intersections, a new roundabout and potentially a closed-off turnaround on Northeast 7th that dead-ends on a tiny park. While PBOT has held meetings and forums since February, the word on the proposed project has been slow to reach households of color. Local boosters hope more families will participate before it’s too late. “When I first heard about it I thought it wouldn’t happen,” said Darcell Dance, who lives on Northeast 9th Avenue and works on Northeast 7th Avenue. If Northeast 7th is slowed for the greenway project it will force more traffic onto Martin Luther King Jr. Boulevard and other nearby streets, she said. Dance said she never received any mailing or notice on her door about the proposed changes, but that now she is better informed she is trying to make sure others are as well. So far she has attended a forum at SEI and chatted at the PBOT table at Good in the Hood, but Dance is concerned that already the Northeast 7th Avenue option is being consistently described in public as the most popular. Albina Head Start Director Ronnie Herndon says that’s why he is watching this process like a hawk. Herndon runs an organization that serves parents and staff from all over the area, which means literally hundreds of vehicles need to pull up to its doors every weekday. He says putting the greenway on Northeast 9th Street makes more sense because it is already residential. “When they came here to talk I took them right outside and we walked up to the corner -- the main thoroughfare for Head Start is right there on the corner,” Herndon said. “If they restrict traffic, it will force hundreds of cars onto King and into the neighborhoods -- and it’s already overcrowded. “This would make it more difficult for people -- frankly, low-income people who are trying to use the services of Head Start,” he said. Rivera said the bureau is continuing to build its relationships with churches, Albina Head Start and other organizations, to make sure the word gets out on issues but also opportunities. For example PBOT last year awarded grants to a dozen local organizations for streetscape and parks projects led by neighborhood residents, organized by Living Cully, NAYA Generations, the Urban League PDX, Rosewood Initiative and more. Several of the grants PBOT recently awarded to neighborhood groups will be used to build “wayfinding” systems designed to help families more easily find parks and green spaces for healthy outside activities where they live -- in Lents, Cully, and outer Southeast. Since February, Rivera said PBOT has gathered hundreds of people together for question-and-answer sessions around the neighborhoods and sent out direct mail to tens of thousands of people who live and work in Lloyd/Woodlawn and along the corridors nearby. Rivera said more than 150 people attended the first open house event last February at King Elementary School, and an online open house received 200 survey responses. The outreach campaign spread flyers and posters to businesses along Northeast 7th Avenue, along King Boulevard, and four elementary schools in the neighborhood. PBOT also tabled at the King Elementary School Community Celebration, Juneteenth and Good in the Hood Festival. Rivera said special outreach was made by phone to SEI Inc., Albina Head Start, the Rerun resale shop, Cafe Twenty Six, and Northeast Fellowship Community Church; a follow-up transportation outreach event was held at SEI. The second open house was held on Aug. 1 at Augustana Church and was attended by over 150 people. It’s still not too late to share your opinion. Find out more about the Lloyd to Woodlawn Neighborhood Greenway, check out the proposals and leave your feedback by clicking here or call the Portland Bureau of Transportation at (503) 823-5185.